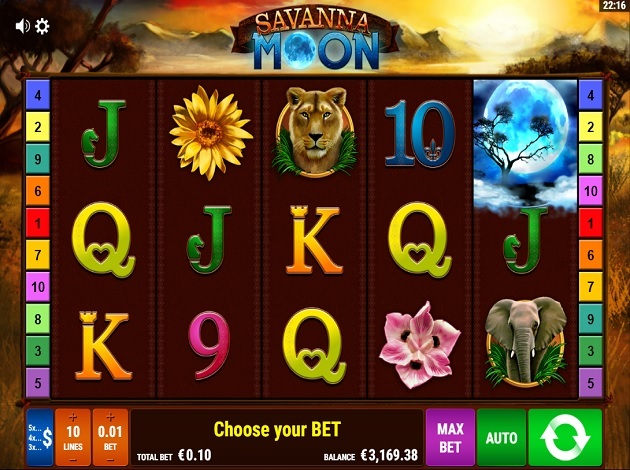 Savanna Moon from Gamomat is a Safari-themed slot taking placed during the beautiful sunrise hours. This adventurous slot has five-reels, three rows and ten total paylines for you to try your luck on. The RTP is at a good rate of 96.13% with plenty of chances to get tripled wins during the free games feature which offers many free games. What’s more is that you can double your winnings in this slot quite often with the gamble feature, if you dare to take the risk that is! Bets in Savanna Moon range from a minimum bet of € 200 per spin up until a maximum bet of € 200 per spin. The wild symbol is of the adventurer which can substitute for all symbols except for the scatter symbol which is a moon. Aside from these two special symbols there are eleven other symbols in Savanna Moon. There’s a lion symbol, an elephant, a tree in the sunset, a yellow flower, a pink flower, an Ace, King, Queen, Jack, 10 and a 9. Three, four or five scatters will trigger fifteen free games. During the free games feature, it’s also possible to trigger additional free games apart from your initial ones! What’s more is that during the free games feature, all wins are tripled! The gamble feature in this slot appears quite often giving you more than enough chances to double your winnings, if you want to take that risk of course. When the gamble feature is triggered, you can choose to either collect your winnings or double them with either the ladder gamble or the card gamble. If you choose the ladder gamble, then you need to click on the ladder button as it goes back and forth between a higher value and a lower value. If you click at the right moment, then you can climb up the ladder as you double your winnings. If you loose then you will go down the ladder until it eventually takes you back to the base game. If you select the card gamble then you need to choose whether you think the next colour of the card will be either black or red. If you choose the right colour, then you can guess again and again. However, if you make a wrong guess, then you will lose your winnings and be brought back to the base game where you can spin until the gamble features pops up again! The highest paying symbols are the lion and the elephant symbols which can reward you with up to 75x your total bet. The tree in the sunset symbol can reward you with up to 40x your total bet. The sunflower and the beautiful pink flower can reward you with up to 25x your total bet. The Ace and the King can reward you with up to 12.5x your total bet. The Queen, Jack, 10 and 9 can reward you with up to 10x your total bet which are the lowest paying symbols in Savanna Moon. Savanna Moon is set in a beautiful safari during sunrise with mountains in the far distance and the sun popping up to the right. The reel itself is a dark brown, neutral colour so that the various symbols can stand out in their own light. The visual aesthetics are extremely easy on the eyes and easy to look at while you spin the reels. There isn’t music playing in the background constantly however when you spin the reels, there are more general gaming sounds that are triggered as well as when you land on winning combinations or trigger a special feature. Savanna Moon is a very calming game with cool visual effects and easy to follow game rules for players of all levels to truly enjoy. Not only do you have the chance to double your winnings with the frequent gamble feature, you also can benefit greatly from the free games feature which can also trigger additional free games during the round, and your wins are tripled during this feature! Enjoy the sunrise in this beautiful Safari-themed slot at Videoslots!